I finished Zoe's hat yesterday, as I mentioned, what I didn't remember to say was that her hat was my second attempt. 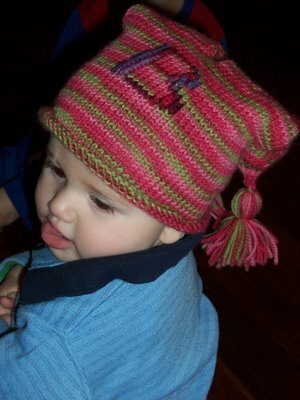 The first hat I did for Zoe was too small, and so it ended up being a Bryn hat. To distinguish between the two if ever they are worn in the same place, I stitched a B onto Bryn's hat this afternoon. It was my first attempt at duplicate stitch and I'm quite pleased with it! Zoe will be stoked that her and Bryn have the same hat too! !